In September I launched an owned-social network for my local village, the community of Blewbury in Oxfordshire. Photo Credit: Oxford Mail. Read article: “Who needs Facebook” here. First, some context. My company PPR, is a PR firm for startups. We’ve been working with community media platform Disciple since late 2017, including the launch of Matt Hancock MP’s community app in February 2018. Having forged its reputation building communities for musicians, lifestyle-coaches and personalities, this launch proved that ‘owned social’ could also work for a politician - albeit with a different audience, ie his local constituency, rather than a fanbase. People like the idea of owned & niche social - ie the functional upsides of social media in a smartphone app, without the downsides of trolling, targeted advertising, irrelevant content etc. So I wanted to see if I could make it work for a local community, in this case Blewbury - the small Oxfordshire village where I live. Long story short, it’s by far exceeded my expectations. This article expands on this and offers a guide for anyone who might want to to the same. Facebook is in decline (few people realise how few people see unpaid posts - about 5-10%) but lots of people like it and will continue to use it for some time. 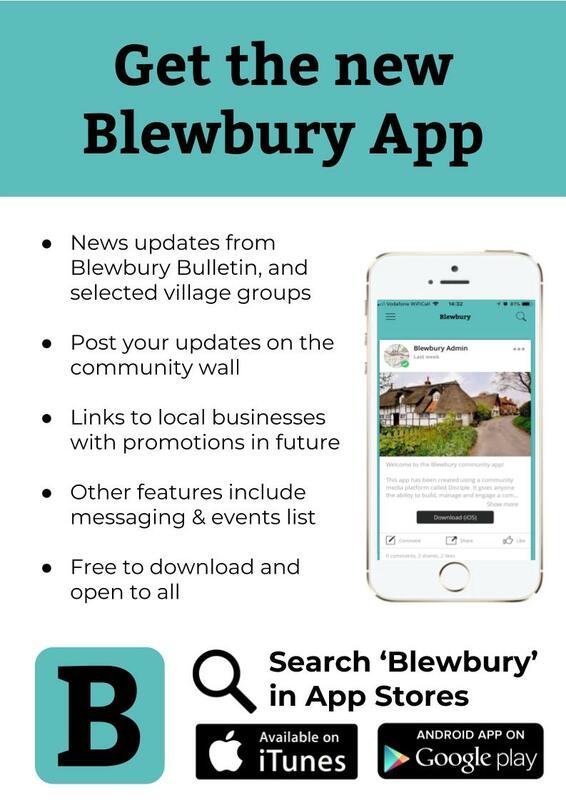 So the Blewbury app has to be different as well as better. On reflection, it might have been an idea to do a ‘community canvas’ (rather like a startup business model on a single page) to explain the how, what, why at the start. The 2011 Census puts Blewbury’s population at 1,500, so allowing for recent development I’d guess it’s nearer 2,000 today. Removing non-smartphone users, I estimated the market at around 1,500, and that if I got a third of that population on the app after six months I’d be doing well. But at time of writing, we have about 400 people signed up. The appeal is wider than I thought. Some members are former residents. People with family here/ nearby. And as a village of historical interest, Blewbury has many visitors, too. My guess is that the circle of interest in Blewbury is three or four times larger than I previously thought. In time, I guess Disciple will learn what ‘good’ looks like for the growth/ engagement in a geographical community, but c. 400 members (today) feels like a decent start. But be prepared for early usage to tail off; you will need everyone in the community behind you to get over the honeymoon period so important to be realistic and plan beyond the initial flurry. Social media feeds are full of irrelevant rubbish for all sorts of reasons. The main one is that social media needs SCALE due to its advertising model. Which means loads of connections and loads of content. Algorithms are getting better at filtering out what you may want to see at any given moment, but more often than not the robots get it wrong. Groups focus relevance a little, but there’s still lots of content that doesn’t add any value. Your community is different and better because it is, by design, focused on a single point of interest. In our community, the biggest criticisms of the Facebook group is that it is full of people either repeatedly pushing commercial posts (ie organic advertising), complaining about what they see as anti-social behaviour (dog poo is a favourite) or generally attention-seeking posts “U OK HON?” that don’t add any value to the community. I appreciate that people want to vent anger to find kindred spirits but this seldom adds value to a community: people have Facebook or Twitter if they want to rant or advertise. So it’s important that your community understands what is and isn’t acceptable so the experience is positive for everyone, and different to that of social networks. The BBC’s “inform, educate or entertain” has worked for 80 years so I’ve followed that, adding a fourth - “ask”. As in, if a post is not asking, informing, educating or entertaining isn’t probably isn’t relevant. It takes time for that editorial to bed in… make sure the rules are visible and clear. Community media sits in the same category as social in that you’re neither ‘dumb pipe’ platform or ‘active’ publisher - but have some editorial influence in the middle. Society is yet to decide where to draw the line which is why social media remains unregulated so this is a big challenge. But this is extremely important. Most community hosts will not have the time nor inclination to proactively moderate, but communities must be moderated. And there is always going to be a minority who will want to cause problems. I experienced this about a month after launch when some kids signed up using false names, posted inappropriate images, trolled other users and started ‘bantering’ with each other. Some people saw this and were initially put off. The Disciple platform has tools to address this, which enabled me to remove the offensive content, and stop it coming back, reasonably quickly. We decided against email verification to remove friction, instead vetting people after they’ve signed up. It’s a feature of the platform that people cannot post, comment or connect without signing up - and when doing so we insist that people sign up using real names. This has helped remove signup barriers but has taken time to verify people after the event; and this continues to be the most time-intensive element but an important trade off. As a geographical community, we want to help bring people closer and grow their own networks in the real world. Being anonymous won’t help that. We can all see who’s who in the pub, post office or park - people in local communities are not anonymous so my hope is that this, alongside the clear editorial policy, means people will be civil even when issues get divisive. That said, even when not anonymous, people won’t always meet the community standards. The neatest platform feature is ‘trusted reporter’. This gives hosts the option to let other community members anonymously delete any post or comment immediately; reducing the onus on the host to moderate. It also creates ambiguity over who reported it. This way the host is is not accountable for explaining any ‘editorial’ decisions, since any number of reporters may have removed the content. If the community is open to anyone to sign up, I recommend picking and brief a team of trusted reporters before launch. Had I done this the offensive posts would have been removed even quicker. Building this app came during Facebook’s Cambridge Analytica crisis, and the introduction of the GDPR into law - a time of heightened sensitivity over personal data. Anyone managing a community is accountable by law for the data they hold - and there were few organisations willing to take this on. While my understanding is that any owner of a Facebook Group should in theory be ICO-registered as Facebook themselves will not take on this liability (it will be interesting to see if this gets tested in law) in practice this does not seem to happen. Either way this is a significant barrier for any community; whether it’s a small local community such as mine (where people don’t want to take on the personal liability) or a larger organisation where legal and procurement departments will need to get involved. Personally speaking, I felt quite relaxed about GDPR since I had no intent to use the community’s data for commercial purposes, and felt more informed than most having worked with many of the companies in the marketing services sector. So in the event, I chose to register my own business as a Data Controller with the ICO; this means my company is the ‘owner’ of the data, and the holder of the terms & conditions. The point is that someone has to take on this Data Controller role to launch a community. I also registered my business as an app developer with both Apple & Google meaning I can publish into the app store. I’m not particularly technical and Disciple’s customer success team helped me with it - in addition to the time all of this carries fees, which need to be budgeted for. Your content will depend largely on the purpose of the community but the menu system allows you to create different spaces within the app for different things. My role in the community is the ‘host’ - in effect the ceo and chairman of the community. I am accountable for building the app, ensuring it meets its objectives and (later) paying for it. I rely on other groups to support the community, who I call ‘publishers’ (people who run community groups, clubs and societies), ‘local businesses’ (who I hope will use the app both as a marketing channel and, in time, help to cover its costs) and ‘members’ (people using the app). I intend to add to these in time but wanted to keep it really simple for launch - partly so as not to overwhelm people but also as I had limited time to create the content! My advice would be to think carefully about what ‘feeds/ sub groups’ you might need in your community to keep it focussed and relevant. And having five or six posts in each section helps people see how it works; decide on your publishers pre-launch and get them set up as best you can. Identify early adopter/ super-influencers: identify the people who you think are most likely to ‘get it’ and back your community. Talk to them about the idea long before the launch. For me this was my friends within the village as well as the ‘publishers’ - the people I need to publish regular content into the app. WhatsApp groups: In my case I hijacked existing local groups, asking people to forward on a message with links to the app, but if starting again I’d create a new one. In the news section it was particularly important to have the editor of the Blewbury Bulletin newsletter supporting us. The first 50 signups came from this group. Email: the Blewbury Bulletin has an email list - I wrote some editorial that went out as an email to the group. Don’t forget this is still the primary digital communications channel for most people. This generated a further 150+ signups. Facebook: I’d been off Facebook since late 2017 but created a new profile to be able to post links to the app into the various Blewbury interest groups. This generated a further 100+ signups. PR: I put together a press release which got covered in the local papers, and featured on BBC Oxford Radio & BBC South Today. Lots of people saw the TV news, prompting a further 20 signups the following day. This creates greater awareness but also validation. Plus it creates fresh content to share through the digital channels above. Since the PR we’ve had a steady stream of signups. Obviously the angle of ‘first village…” won’t work for anyone else, but shunning Facebook is a story local press are very keen to tell! Firstly, helping your community to use the app takes time.. The app is pretty simple for anyone who is familiar with social media but many people using this app are not - particularly older people who are not ‘digital natives’. I’ve had an unexpectedly high number of older people who see the app as a reason to start using digital technology, and have asked me about what smartphone to buy. With that in mind I made a how-to video using iMovie, which is pretty lo-fi in terms of production values but does the job. We also have an email inbox for questions: and have had a number of phone calls from people. I would strongly recommend talking others in your community through the app and asking them to help others - some people will need talking through face to face. Secondly, you need a steady stream of good content. For the most part, content for social media works fine; currently I have about 4 groups in the village posting fairly regularly and as more come on to the app it will get even more useful. But good content takes time. I’m very aware we are in the ‘honeymoon’ period with Blewbury and that the app needs to overcome launch enthusiasm and prove itself useful over time. I’ve been encouraged by the start and steady organic growth as word of mouth spreads but am not taking anything for granted. Looking ahead I will be promoting the app more to community groups and encourage them to come up with new content using the app; things like polls, plus new content like video and podcasts. Finally, and critically, the app needs to be paid for. I’ve covered the costs personally thus far. But, unlike social media, there are no revenues from targeted advertising we need to find other ways to pay our rent to Disciple (for starters). It may be that once we’ve made a business case for it, we will be able to get some funding from local councils. Charging local businesses for classifieds is another option, as is an affiliate marketing scheme of sorts where the community gets a cut of any exclusive promotions. A modest members’ subscription fee/ Guardian ‘benefactor’ model may help. As could ideas like sponsorship of the app (a naming-rights model, rather like a TV programme or sports stadium) - is another option, provided it doesn’t undermine the integrity of the community. And while we’ve ruled out targeted advertising, sponsored posts could be a future option. Or a mix of all the above. But whatever the model, I’m confident we can cover the costs once we’ve proven the value over time. Finally, I hope you find this post useful and it encourages you to look at the communities that matter to you. Could they be better served by your own social network, or should you leave it all to Facebook? I hope you decide to take your community’s digital future into your own hands!